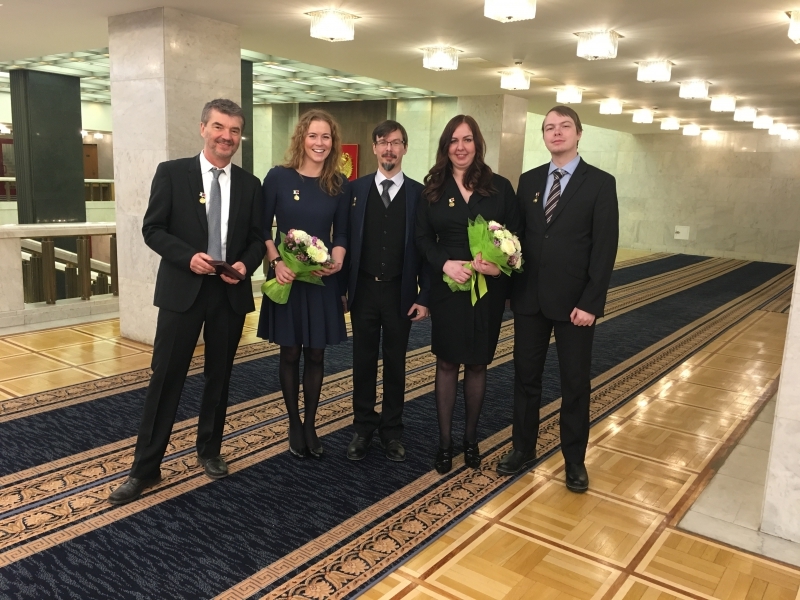 Yesterday, on February 9th, the House of Government of the Russian Federation hosted the award ceremony for the Russian Federation Government Prize in Education of 2016. Olga Vasilyeva, Minister of Education and Science, and Deputy Prime Minister Olga Golodets awarded the 19 laureates. Five awards were given to members of ITMO University for developing a complex procedure for selecting and training highly qualified world-class personnel in the field of Information Technologies. The Russian Governmental Prize in Education is one of the most prestigious awards in education. "Above all things, this award means the well-deserved acknowledgment of your efforts, — commented the Minister, — I am sure that you will remain being the most active agents of the educational process as you are now, and we will create an even more effective educational system for Russia"
Among the award winners from ITMO University were Alexander Boukhanovsky, Director of the School of Translational Information Technologies, Daria Kozlova, Vice Rector for International Relations, Maksim Buzdalov, Associate Professor at the Computer Technology Department, Maria Skvortsova, Dean of Faculty of Higher Qualification Expert Training, and researcher of the School of Computer Technologies and Controls professor Peter Maria Arnoldus Sloot, who’s become one of the very few foreign nationals to ever receive this award. According to the professor, this award is a result of a consolidated ITMO University team effort that he is happy to be part of. Thanks to the procedure developed by ITMO University's team, Russia will train specialists that can work in interdisciplinary fields, solve practical tasks and manage innovative projects and companies in the field of translational IT. The procedure has already shown great results: even now ITMO is seen as a university with the best programmers in the world. Also, in 2016, the Alma Mater of six-times world champions in programming got into the top-100 universities of the Times Higher Education subject rating in the field of Computer Science. Other awards were given for developing a complex of scientific and methodological publications for the system of higher psychological and pedagogic education and set of educational aids for new programs in Stomatology. You can read about the procedure developed by ITMO's team in more detail here.